You are currently browsing the tag archive for the ‘diversity’ tag. I picked up this easy to read 135 page book when I went to see His Holiness Sri Sri Ravi Shankar while he was here in Boise. Until recently, I had never even heard of him but all of a sudden, I have seen him twice in 2 days (1st a major public appearance and 2nd at a private gathering at my church) and now I have read just one of his books. When I went to the resource table at the big event, I looked around at all the books and all the cd’s that were there. The title of this book is why I ultimately chose the book. I can always use a little more fun in my life. I have to say that when I started reading the book, I kept hearing Sri Sri’s voice as if he was saying it to me instead of me reading it. It made reading this book so much more fun. I saw his gentle smile and heard his laughter in the words he wrote. I saw the mischievous look in his eyes when he cracked the jokes. It really did make this book that much more enjoyable. 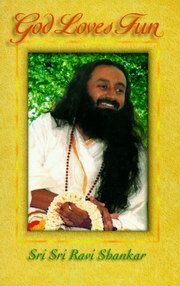 But even without that first hand experience with Sri Sri, the book is a very easy and enjoyable read. It does get into some very deep thinking, and I did have to re-read things on several occasions. This is definitely a book that will need to be read a couple of times. Good thing it only takes a couple of hours to read to begin with! So what did I learn? It is more about what I re-learned. I take things too seriously. Reading this book just reminds me of that. I learned that God loves fools and that being foolish is really being more like God than being this serious person is. The chapter on being a fool was very enlightening! I learned more about laughter! I have taken laughter yoga classes, and this just reiterated what I learned from those classes. He also talked about observing our feelings; this is something I was working on in therapy. This is also something I read about in Geneen Roth’s book. So here I go again, re-learning it in this book. Being mindful of my feelings, allowing myself to feel them, and then let go. Sri Sri suggests taking the feeling to its height (which may mean feeling at your lowest) and once you have done that, you have felt and experienced all there is to feel with that feeling and it will just disappear. How cool is that? He says to feel it, but not to act on it. Stop paying attention to happenings. When we are attached to happenings, we create opinions, then we are stuck and attached to them. We are living in the past and we will never remain open to new experiences and live in NOW. I am you. You are me. We are God. We are all one creation/mind manifesting itself in different bodies. This brings a whole new depth to the belief that we are One. The book explains it so beautifully :). In most of our problems, the biggest issue we have is the fight we have with our mind. This is so true. When I am miserable or depressed or stressed, it is because of an issue/conflict I am having within my mind. It is MY experience, my THINKING that is causing me so much distress. Sri Sri talks about letting go and surrendering. and Forgiving myself. Here is a great strategy for life: “See life as a game, as a play. You are God, you know it. I am God, I know it. So let us play. And when you come from that level of consciousness, there is nothing to teach. Only being. Come and sit, be with me for a while. That is enough, for you and I are one. This is love, isn’t it? That is what God is telling you every day, ‘I am doing everything. You come and sit with me. Whatever needs to be done, I will get it done through you. You simply stop existing. '” I know I am guilty of taking life too seriously..always looking for a connection to God..always learning..always searching. It’s what I do. Yet, I have found recently that all I want to do is do things that make me smile, feel joy and live. I find myself wanting to PLAY and be joyful. Not only am I WANTING to do this but I AM DOING this. It’s pretty darn cool! I will close with this last quote found in the chapter about being a fool. “George Bernard Shaw said somewhere, ‘Cricket is a game where eleven fools play and eleven thousand watch.’ It is true. All games are foolish acts. A game is a game because it is foolish. If you find meaning, purpose, aim and competition, you destroy the whole game.” How about we just stop looking for the meaning of life, and just in-joy it! Have fun! Play! Laugh! And just BE!